Got back into riding about 2 yrs ago after taking about 6 yrs off due to Daddyhood and etc. I picked up a Fantom Pro 29er but was never happy with the riding position (Top tube is way long on the L frame) and the aluminum ride. So this spring, on a lark I built up my old Rockhopper as a SS and re-discovered my love for riding and a new love for SS. I picked up a used Dambala frame in the classifieds here for $175 and dismantled the Fantom. I grafted the Tora 318, Juicy 3's, and the seat onto the frame. I then got a shim kit and a surly 20T cog and converted the rear wheel to SS. Picked up a Stylo 1:1 with 180 cranks and put a 32T Chainring on it. 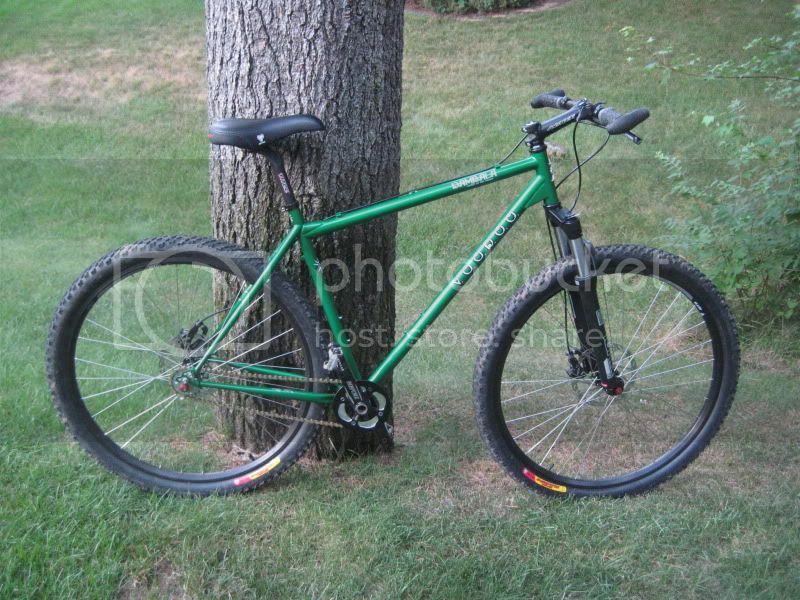 This bike rides, handles, and climbs like no other bike I ever had. The geometry is perfect for me. SSing has really improved my conditioning , technique and line picking. The silence of the drivetrain adds a nice touch as well. I had read posts in here about guys complaining about the riders on derailleur equipped bikes always getting in their way on uphills while they fumble with their shifters and I thought that would never happen to me but now after a couple rides, I find myself constantly up my riding buddies asses and passing them on hills. Now 2 of them want my advice on converting their spare bikes to SS, this after scoffing at me when I first showed up with one gear!